Did you ever wonder what it would be like to have a custom designed dress? A girl can dream, right? Well, eShakti makes this dream absolutely possible! eShakti is an online retailer that specializes in one-of-a-kind dresses, skirts, jackets and tops that offers unique designs and fit for each shopper. When I first laid eyes on this Tropical Floral Denim Dress, I knew we would be a match. I absolutely adore the sweetheart neckline, the flirty peplum bounce at the hem, and the stretchy denim material. Since I am petite on top I was nervous I wouldn't be able to keep the dress up. I love wearing strapless dresses, but I always have to be conscious of my body type. When I learned that each piece of clothing is tailored to your height, weight, and body type I was intrigued. I have always struggled with standardized sizing. It's either too big, too short, too tight, too long, too low...you get the point. So I decided to test out the custom sizing offered by eShakti. It was a quick and easy process. I went online and browsed the recent summer collection. Once I selected a dress, I referred to the sizing chart and entered in my measurements before placing the order. I waited patiently and the dress arrived about 10 days later. I was so excited to try on the dress and to test out the fit. The result of the custom sizing? Absolute perfection. This dress fits me like a glove! I am so impressed with the services offered by eShakti. In addition to the custom sizing, you can also create your own style by choosing a sleeve type, length, and neckline. How cool is that?! Since I ordered a strapless dress I did not play around with the styling options, but this fall I'm going to order another dress and play around with the styling tools. Scroll down to see more eShakti looks that I am currently obsessing over! One of them is perfect for fall ;). More eShakti looks I'm loving: The Batik Print Trapeze Dress and The Spectacle Print Cotton Dress. How adorable would this black trapeze dress look for the fall paired with cognac booties and a metallic belt? Ugh, I'm dreaming about it! I know you will enjoy the eShakti offerings as much as I do, so give it a try and let me know your thoughts. Don't forget to show eShakti some social love by giving them a like on Facebook, and a follow on Twitter and Instagram! 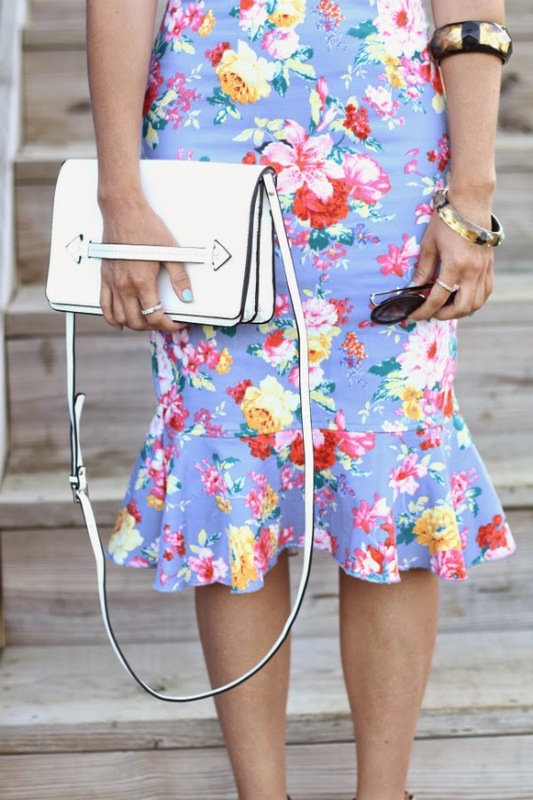 That dress is such a lovely print!